This versatile vibrating level switch requires no calibration and is available with relay, transistor, or current outputs. TF-100 Series is a vibrating level switch with TF-L relay output and TF-P transistor output or with TF-T current output. 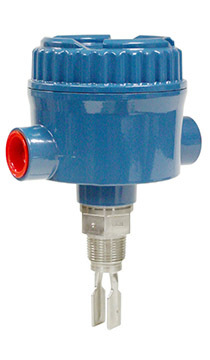 This level switch is designed for reliable indication of clean liquids and light slurries. It is available with Relay, Current, and PNP outputs that can be set to indicate alarm on either high level for spill prevention, or low level for run-dry protection. The TF-100 Series comes in a compact design with sensor lengths as short as 1.9" (47mm). The compact design makes this level switch ideal for limited space installation. It carries FM hazardous area approvals and is available in sanitary models for pharmaceutical, food and beverage applicaitions. The TF-100 Series vibration technology level switch is an excellent choice for most high level or low level liquid level measurement requirements. The TF-100 tuning fork requires no calibration and is not affected by changes in electrical properties of the material being measured.